Yeah! So after months (if not years) of talking about how I love dumplings, in the theoretical sense, yesterday I got the chance to love them in the actual sense! Apologies — lost these photos when I switched blog hosting, so you’ll have to enjoy this gorgeous photo by someone else, instead. * Mix dough in bowl till smooth; add water as necessary but not so much that it gets sticky. Knead and set aside. 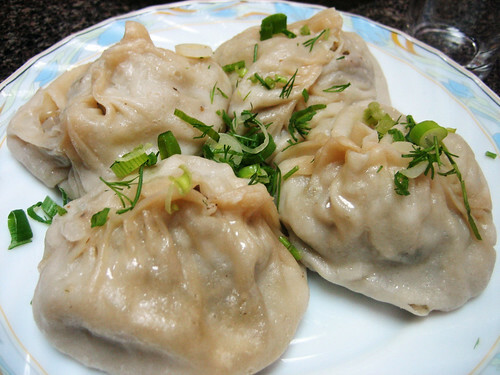 * Manti is usually steamed but can be boiled or ensouped. You’re not supposed to cook the filling first, but I sauteed the onions then added meat, to make sure they would cook all the way through. Next time I’ll just try steaming. Make sure the meat is oil-drenched, as that’s a big part of the flavor. * While the filling cooks, boil water in a saucepan and put a metal colander on top. Rub the colander with olive oil before adding manti. * While the water boils, roll out the dough as thin as you can. (Mine wasn’t thin enough, so my dumplings were a bit doughy). Put a spoonful of the meat and onion filling on the dough and cut around it. Pinch the corners of the dough together over the filling, and pinch all the sides closed. * Set the manti in the colander, trying not to let it touch its friends. Put a lid on top, and steam till dough is translucent. I did 10-15 minutes but could have gone longer. Pull out and serve hot. For successive batches, remember to check that there’s still water in the pot, and refill as needed. * For sauce, I dipped mine in cream cheese and salsa. Other recipes, though, recommend a yogurt and garlic sauce, with tomatoes and red pepper drizzled on top. Soy sauce or hot sauce would be great as well. Delicious. I caught a dishtowel on fire over the gas stove, and almost set a pan on fire when the water in the bottom boiled off. But… the house is still standing and the dumplings are tasty, so I consider it a success. My next plan is to American cheese, tomato, and mustard, and see if I can’t make All-American Hamburger Dumplings. Kind of like a slider, but with actual meat and in dumpling form. I’m sure they will be a hit.